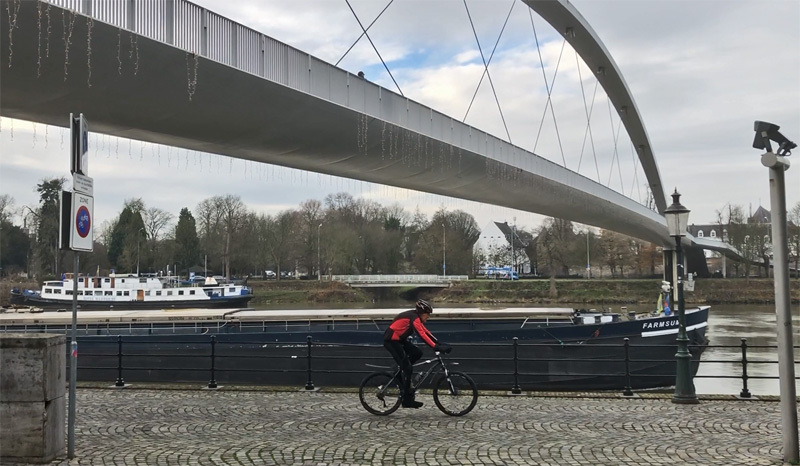 The bridge for cycling and walking across the river Meuse (Maas) in Maastricht has become a modern icon for the city in the 15 years it has existed. The arch of the bridge towers over the buildings and can be seen from far away, notably from the hills around the most southern city of the Netherlands. 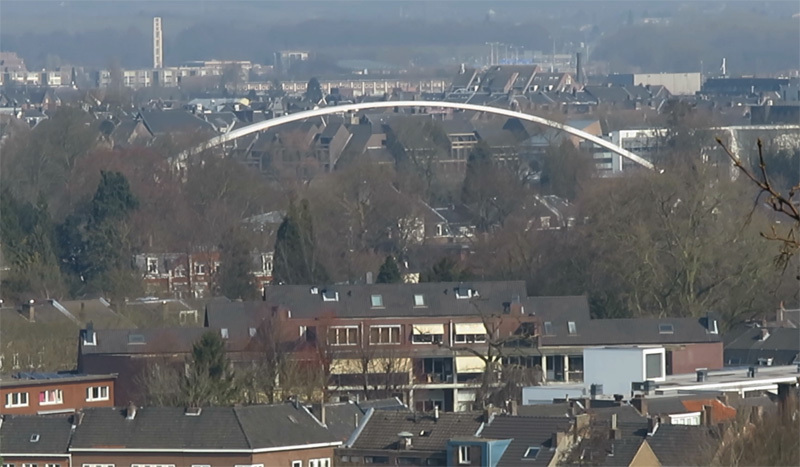 The arch from the hill near Maastricht (Sint-Pietersberg). A picture I took on an earlier visit. The bridge is called ‘Hoge Brug’ in standard Dutch and ‘Hoeg Brögk’ in the local dialect. Both mean ‘Tall Bridge’ and that’s exactly what it is. 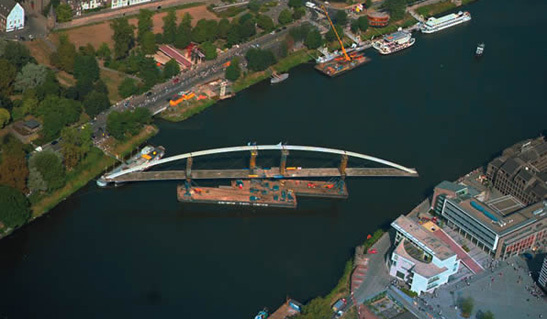 The deck bridge is already 10 metres over the water of the River Meuse, but the top of the arch is at 26 metres over that water. The river Meuse is an important shipping route to Belgium, Germany and France. The waterway authority therefore demanded that ships would not be hindered by pillars. That is why the bridge has one giant span of 164 metres. The total length of the bridge, including the access stairs, is 261 metres. The bridge deck is 7.2 metres wide and has a clearly defined space for cycling and another for walking. View of the bridge from Plein 1992, Square 1992, which commemorates the Maastricht Treaty, that was signed that year. The bridge was opened in 2003. Three years after the death of the Belgian architect René Greisch, who designed it. The website of the architect’s bureau informs that the bridge has cost 5.3 million euros. That seems a bit on the low side for such a huge bridge, but maybe not all the costs, of placing the bridge for instance, were considered in that amount. I could not find any other reliable source for the cost, so this is the only information I have. Shipping traffic is very important here, that is why there are no pillars that could hinder ships. It made the span 164 metres long. It is most unfortunate that this bridge has no ramps you can cycle onto. This is due to the considerable height of the bridge and the location. Cyclable ramps would have had to be so long, to prevent them becoming too steep, that there simply is no room. The bridge near the Central Station in Utrecht has the same issue. 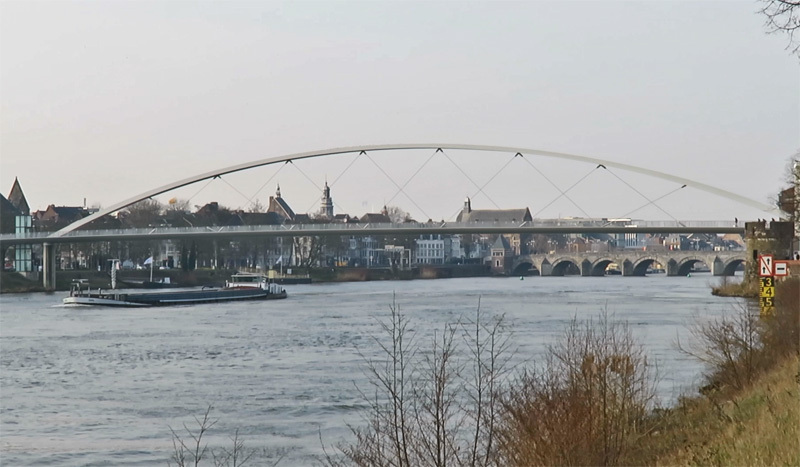 The Maastricht bridge connects the historic city centre west of the river Meuse with a redeveloped former factory terrain east of the river. Maastricht used to have a ceramics industry, producing table ware and sanitary ware, but also engineering and other types of ceramics. At this particular location the factory was called ‘Société Céramique’. This inspired the city to call the regenerated area: Céramique. On the city centre side, the stairs end in the park around the old city wall. On the other side the landing is at “Plein 1992”, or square 1992, named after the Maastricht Treaty, signed in 1992. The Dutch consider that treaty the birth of the single European currency, the euro, and consequently Maastricht its birthplace. The river Meuse with the old centre of Maastricht in the background. The span is really impressive. The bridge was constructed in Krimpen aan den IJssel, about 250 kilometres downstream from Maastricht. It was literally shipped to its final location in 48 hours. It was placed in just 8 hours on Saturday 16 August 2003. After it was finished on location, the opening took place on 18 December of that same year. The bridge was festively opened by the state secretary of Spatial Planning, an indication of how important and special the bridge was considered to be, when such a high-ranking official comes all the way from The Hague (also about 250km away) to do that. 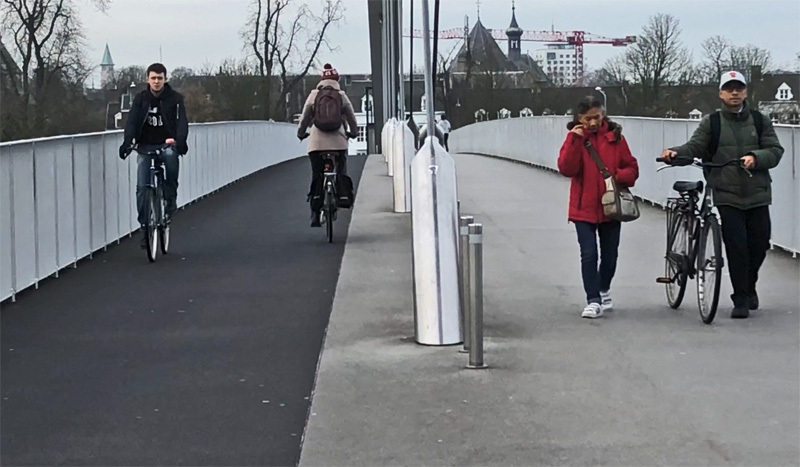 The 7.2 metre wide bridge deck is wide enough to give walking and cycling each their own space. This being a cycle bridge (as well as a bridge for walking), it is no surprise that people dislike the staircase. Not only the fact that there are stairs at all, but also the way the staircase was constructed. Calling the stairs gentle sounds too nice to some. The steps have a very deep tread combined with a very low riser, so people complain that they can’t take two steps at the time (because that is too far), but they hate making mini-steps of just about 5 cm per stair as well. I have the feeling that the people complaining are not the ones pushing a bicycle. Because when you are, it is very nice that the stairs aren’t too steep. It makes pushing your bicycle up a lot easier. As you can see in the video, most people don’t seem to have any problem getting their bicycle up. If you do have a problem with it, there are elevators at either end of the bridge. But I only saw children and elderly people using these elevators. Maybe the complaints about the stairs are a bit exaggerated. That one line about not being able to take two steps at the time stems from one article which was copied many times and the remark now appears all over the internet, including the Dutch Wikipedia page. Now I even translated it into English. Which may mean I only have made matters worse! 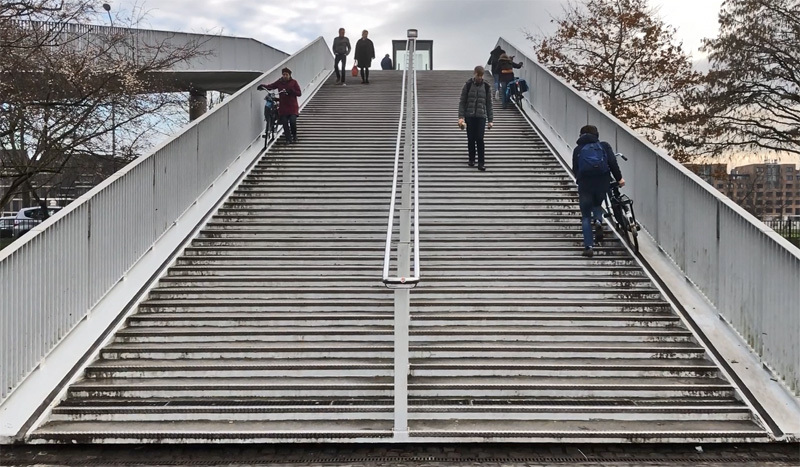 Because these stairs really can’t be too bad, 2,500 cyclists use this bridge every day! Maybe people have also simply gotten used to the stairs after 15 years. The stairs on the city centre side. They look far more challenging on a picture than they are in real life. It is clear from this picture that the bridge could do with some maintenance again. There is an elevator on either side that can be used by people who do not want to use the stairs. In the distance Plein 1992. The arch was constructed on site. 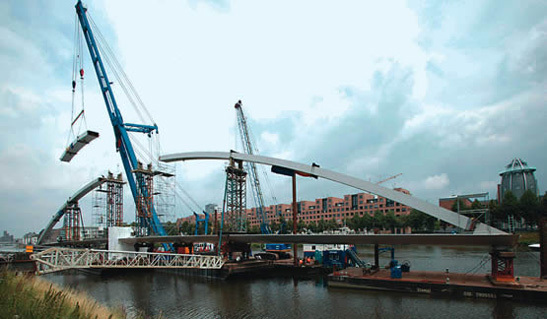 The bridge parts were fabricated 250 kilometres downstream and shipped to Maastricht. The entire main span was put in its final place using two pontoons. The whole procedure took only 8 hours, so the river didn’t have to be closed longer than necessary. In 2010, the bridge was closed for several months for elaborate maintenance. During that time the deck got a new top layer and the stair nosings were replaced. The entire bridge also got a new coat of paint. Enough to last about 8 years, they said back then. So that would mean it should be updated again around about this time, and indeed, the bridge could use a new coat of paint, the white is not exactly white anymore. We’ll have to see whether that gets done any time soon though. 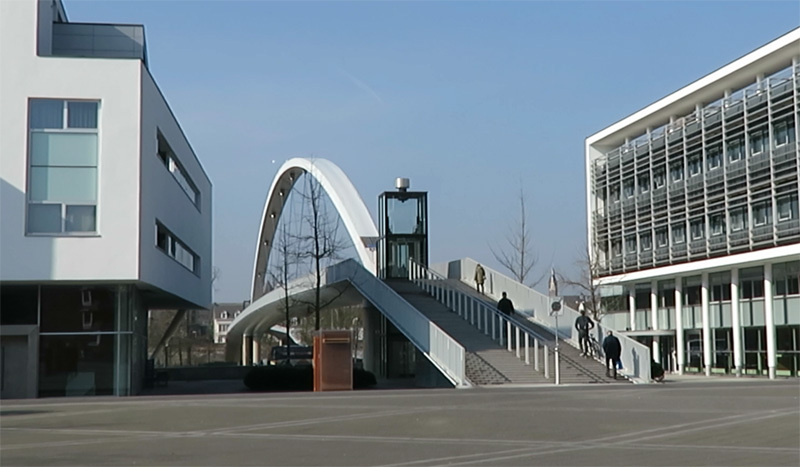 This week’s video about the Maastricht “Tall Bridge” for walking and cycling. One last remark, not really related to this story: this is my 500th post on this blog! Thanks to all my followers for making it worthwhile for me to create all those stories and films for you all. I hope to continue to make new posts and videos that you will enjoy reading and watching. Please do continue to give me feedback. I am certain your imput improves my work. Thank you all very much! A much more legitimate complaint about the stairs is that they were built for right-handed cyclists only. There should also be troughs for bicycle wheels next to the centre railings for left-handed people. If the stairs are very short, left-handed people can simply move to the other side. But these stairs are so long that such a person going up would encounter a right-handed person going down. Someone would have to take their bike out of the trough and give way to the other person. Not the end of the world, but a nuisance. I live in the city of Hamilton, Ontario. 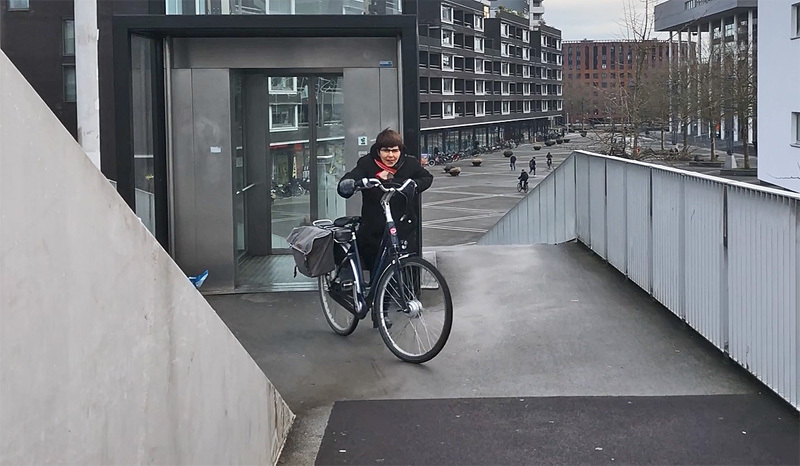 Recently the city made a mistake and installed a set of left-handed bicycle stairs. As a right-handed person, I can testify that it is somewhat awkward to use left-handed stairs. I presume that left-handed people in Maastricht experience the same problem every day in using these stairs. Congratulations on 500 posts. I enjoy your fascinating, high-quality blog very much and read it every week. Congratulations on your 500th posting! I always look forward to your very informative and entertaining videos! 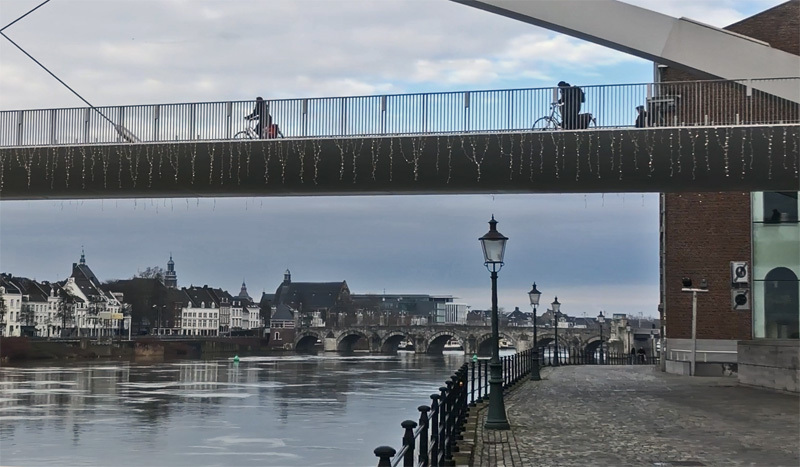 This entry was posted on 27 February 2018 by Bicycle Dutch in Original posts and tagged big bridge, exceptional cycling infrastructure, Maastricht.